Suwon Bluewings FC MEN official uniform worn by Kim Junsu in the last 15th game has been in process of auctioning for ‘Auction of Love’. When Kim Junsu’s uniform was put into auction on April 18th at 15:00 at Suwon Nine homepage, the value started with 30,000 won, and by April 22nd at 18:00 the price has reached 1 million won. Once the auction meets its deadline tomorrow on April 23rd at 17:00, it’s expected that the price will be exceeding 1 million won. The uniform auction will be held until April 23rd at 17:00 and the full amount of final bid will be donated to community welfare in Gyeonggi-do under name of Kim Junsu and the final auction winner. 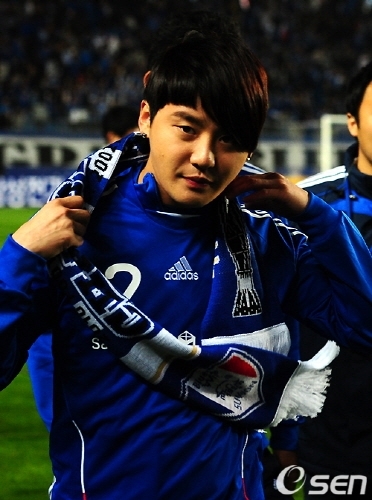 Kim Junsu will also continue to participate in future social contribution events held by Suwon Nine. Suwon is set to have a home game against Gyeongnam FC for Hyundai Oil Bank K-League 2011 at Suwon World Cup Stadium on April 24th at 19:30. While before the main game, at 17:00 FC MEN will hold an opening game against women soccer team Incheon Design High School. In addition, before the end of half time of game against Gyeongnam, Kim Junsu will sign autographs and take picture together with 4 lucky people including the highest bidder as well as 3 other winners to express his gratitude towards them. The opening game will be first introduction of FC MEN members soccer skill in front of their fans, all idol members of the team such as Kim Junsu, Kim Hyun-joong, Yoon Do-joon, Im Seulong are expected to participate.